I think the Life-logic circuitry can be simplified considerably if the neighbor-count chute is modified a bit; in particular, if the stream of gliders that reads the contents of the chute is slowed down to (let's say) p64, then it's possible to check that either the #2 or the #3 neighbor-count glider is the first one out of the chute -- and then suppress the #2 neighbor-count glider with a negated cell-is-ON signal. Okay, now imagine a Unit Life Cell with no moving parts. 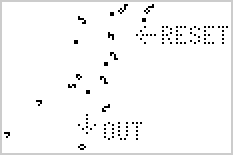 An infinite grid of OFF unitcells will just sit there; it takes three appropriately-timed gliders from neighboring unitcells to activate a given cell, and then it stays activated only as long as two or three gliders keep coming in to sustain it. 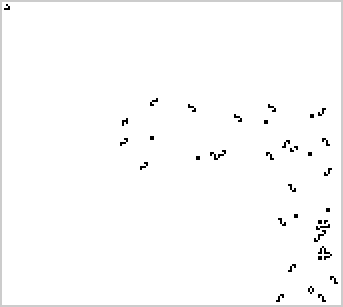 A glider at some critical spot still means the unitcell is ON, and the lack of that glider means that it's OFF. Then the trouble starts. If the unitcell can't have any moving parts, there can't be a "timing gun" in it saying when to look for gliders from neighboring cells. So we have to always produce a "timing" signal at exactly the same time no matter which gliders come in from neighboring cells -- one glider, two gliders, eight gliders. The size of the ladder means that 512^2 is probably too small to hold the entire stable pattern -- but the next larger power of two, 1024^2, should be plenty big enough. And it should be relatively easy to adjust the period of the cell to a power of two, as well: probably p8192.